Marvel nerds! Your next delicious morsel of Marvel fandom is here! Gaze upon it with your all seeing eyes as the latest bit of goodness of that Kree Warrior Carol Danvers, more popularly known as Captain Marvel, is here! The first teaser gave us a little tease of Captain Marvel, crash landing into a Blockbuster Video in the 90’s, rocking the red and blue duds that the fans have grown to love. Now the new trailer gives us more — more of the Captain Marvel costume, both with the mohawked helmet and without, more Samuel L. Jackson, and a closer look at the Skrulls, those Fantastic Four villains supplanted into the Marvel Universe to menace Carol Danvers. The trailer also gives us some new visions of Jude Law, and an explanation of who the Kree are. 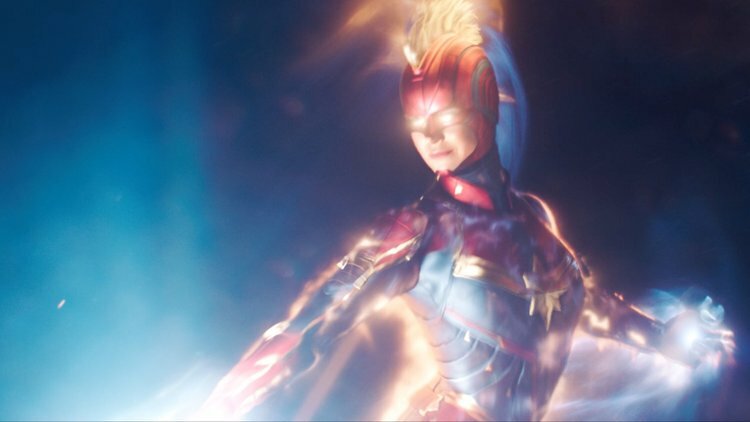 It looks like the movie is an adaptation of the Kree-Skrull War storyline created by Roy Thomas, Neal Adams and Sal Buscema back in the 1970’s, with Carol talking about being enhanced by the mighty power of the Kree, and the world robbing Skrulls are here to make life for human beings all the more difficult. That and we get the basic story. Carol Danvers, an air force pilot shot down, made her way to an alien race who gave her strength (and apparently agelessness given that when she is set to appear in Avengers 4, she’s going to look exactly as she is then). Carol teams up with SHIELD agent — not yet leader — Nick Fury and also the cat she has is adorable. This is the first major MCU trailer to be released following the death of Stan Lee, and it’s the first for a Marvel movie starring a woman (only took seven franchises or so, huh). This keeps connecting to the great Stan Lee adage of showing people who very much need powers — be it dorky Peter Parker or Carol Danvers representing a bold step for women in superhero films — and using them to better the world. The trailer feels like an honor to his legacy.